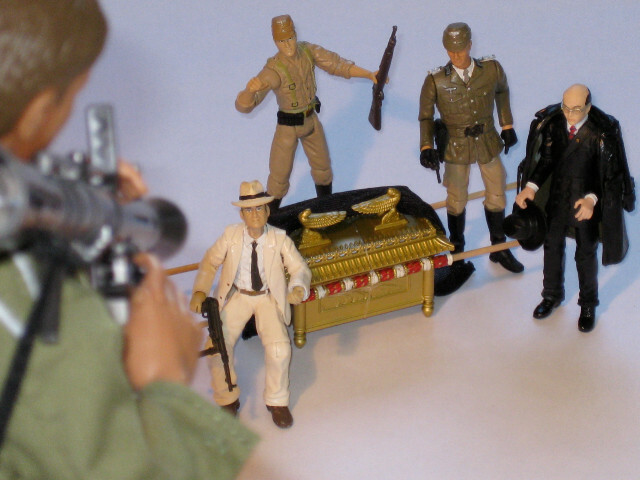 Lightmanrotj checks in with a review of one of the last wave of 12" Indiana Jones figures from Hasbro - Indy in German disguise. Don't recognize it? That's because it shipped to very few retailers, most in the Northwest. And just as you'd expect, he has the best head sculpt of the series. Tell us all about him, lightmanrotj! A big thanks to Michael for enabling me to toss in my ten cents here – I’m a huge fan of the site. 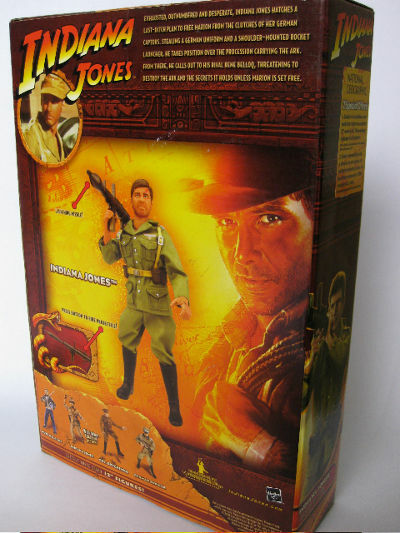 So the Hasbro Indiana Jones toy line has been dead and buried for a while now, and, like at some funerals, it was a somewhat ugly affair with people attempting to lay blame for the death, and bitter talk of whether it was preventable or inevitable. Me, I think Hasbro should be congratulated – it was never going to be another Star Wars line (the 1982 Indy line died a similar early death even on the back of a truly great movie) and while some of the earlier offerings bordered on abysmal (you will be hearing from Karen Allen’s attorney, Hasbro) the later ones, once all the kinks had been worked out, were phenomenal and surpassed the best of the Star Wars line, with dead-on likenesses and awesome quality. 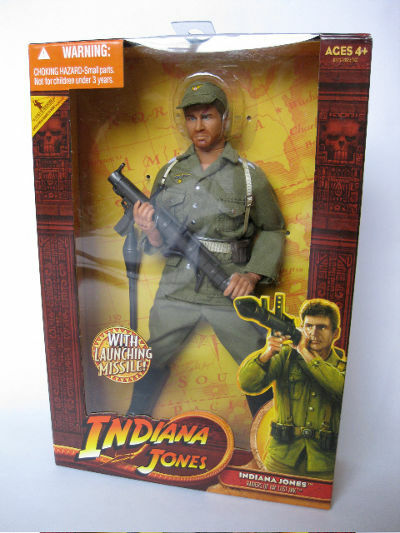 So it falls to me to deliver perhaps the last review of a Hasbro Indy item – the almost-didn’t-make-it-to-retail 12” Indy in German outfit. There were a few other 12” items that were in this marginal category – a somewhat wide release Dovchenko, another Mutt with jacket, which made it to retail in a very limited way like German Indy, and a Temple of Doom Indy (what appeared to be basically the whip-crackin’ Indy with no sleeve and a machete) which didn’t at all. The latter ended up as only an image on the Hasbro website. 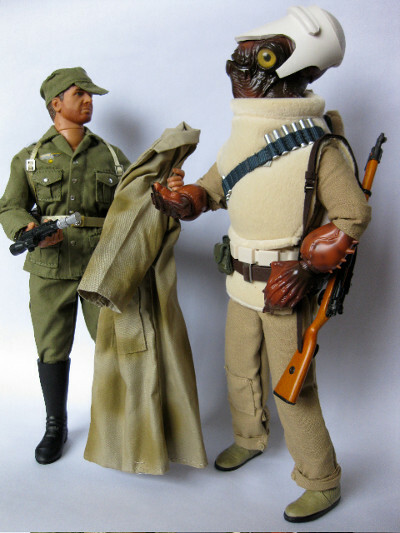 This German Indy figure has taken on some greater relevance recently due to Sideshow’s decision to make their next 12” Indy release this same outfit – not exactly a choice that screams “worth $90” to me but now sold out nonetheless. 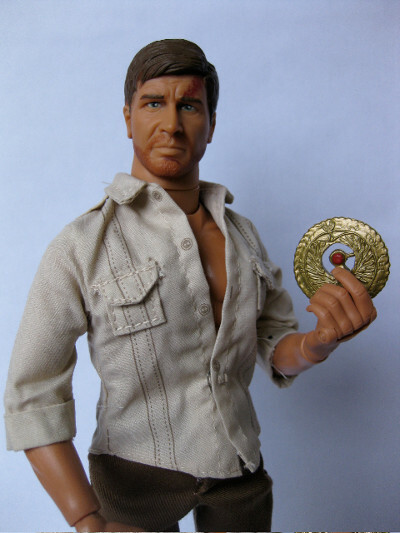 Many were expecting Mola Ram next (myself included), and I can only hope the Sideshow German outfit figure is a place-holder of sorts while some kinks are being worked out on something better… or that George carries through with his threat to make another Indy movie sooner rather than later! I really liked the Hasbro Indy line packaging, with its distinctive yellow and parchment map background. They redid the 12” box on these later releases, flattening the window at front, a little more generic in look, but still decent. The twist-ties/clear bands are still the bane of any Hasbro 12” product, but that’s been the case since the relaunch of the Star Wars line almost 15 years ago. I will also say that they really ratcheted this guy in, nearly damaging the wrist joint and creating a rub blemish on a hand it was so tight. 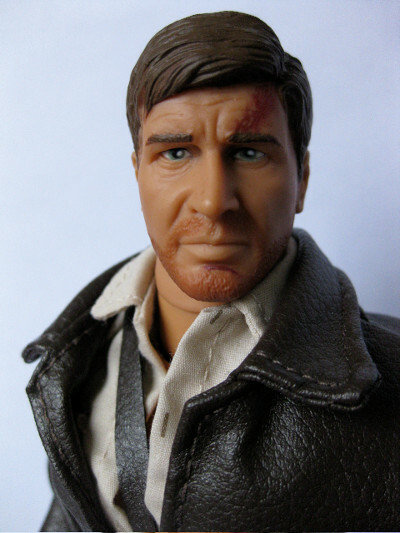 This is a tough one – we’ve all seen the high-end stuff, and I’m not sure who hasn’t taken a crack at Harrison Ford’s mug avec stubble (well, okay, Hot Toys hasn’t – and THAT would be the keeper.) 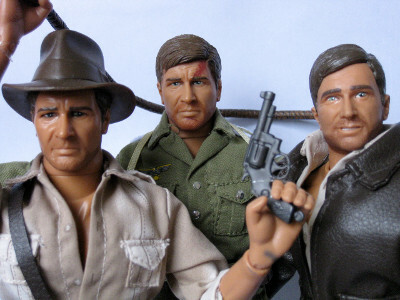 All were passable to good (except Gentle Giant – I think me with a tub of playdoh and a popsicle stick could have done better) but somehow fell short in my book, though the PF Indy came real close, tanned complexion and all. Believe it or not, this Hasbro head is the same mold as the Whip crackin’ Indy, with elements of the hair from the talking Indy blended in. There must have been some Pawtucket alchemy at work here, because they’ve somehow taken a sow’s ear and turned it into a silk (well, faux-silk) purse. I’ll get to the paint section below, but suffice to say, the combo of a slight reconfigure of existing elements using a more matte and “detail-holding” plastic, coupled with vastly improved paint apps have elevated this head above what it was. It’s really a night and day difference. 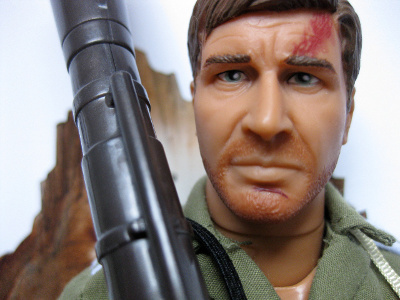 There’s a good dollop of Harrison Ford in there, and it works well for this type of mass-market toy. They’ve done a remarkable job on this. I will just say up front that I would have added another � to full star had my second Indy of this type not had the greens of his eyes painted on his eyelids, looking like mascara. But honestly, this is a gorgeous paint job, perhaps a little heavy on the stubble, but even the high end stuff gets tripped up on that. This is a standard, decent body for a $20 figure, nicely proportioned (if a little short, maybe 11”) one that Hasbro introduced in the final year or two of their Star Wars 12” line. This one lacks any action feature, so no big flesh-color button (like on whip crackin’ Indy) to hide with your figure pose, and has a quite a good range of movement. It has those kung-fu grips hands, and they work fine, though some of the joints (elbows in particular) can be a little loose. 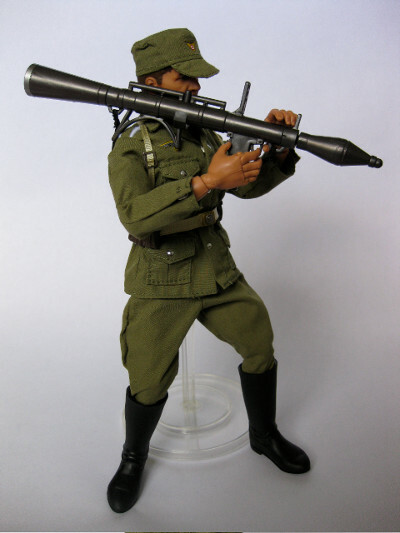 This guy obviously comes with a bazooka (to recreate the classic face-off with Belloq,) which is remarkably accurate to the movie for such a mass-market piece. 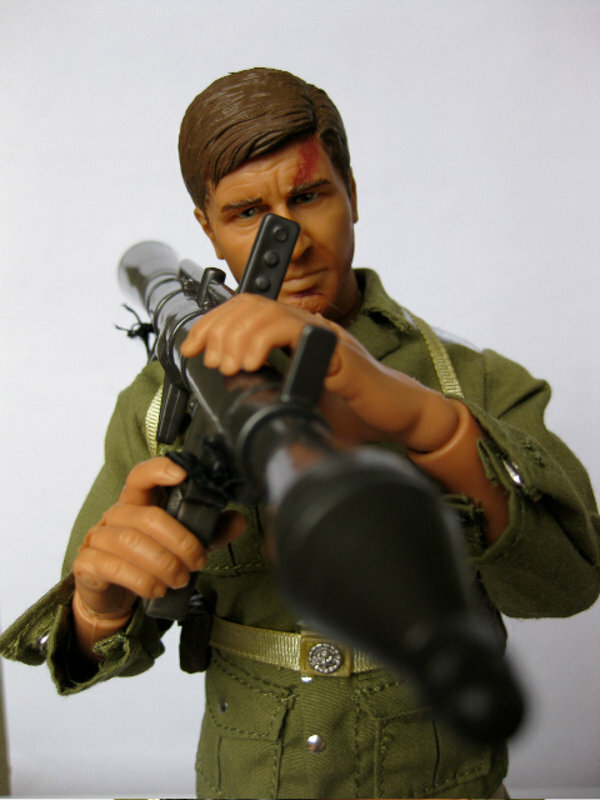 There are any number of cheapo bazookas (Zacca makes a bunch) Hasbro could have sourced and included, but they chose to sculpt the actual one, so extra points from me. It’s appropriate too, because as with much of the hardware and vehicles in Raiders, it was custom-created specifically for the movie out of bits and pieces, though this weapon is pretty close to an RPG-2 (which wasn’t around in 1936 by the way.) It has a spring-loaded firing mechanism, which fires the round exactly one foot. 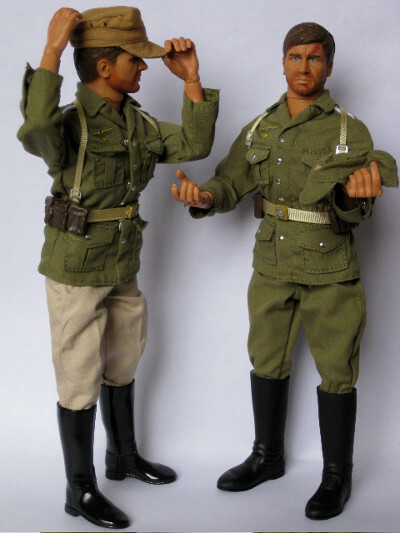 Hasbro encountered a few issues in the Indy line both in 3 �” and 12” in terms of depiction of Nazi insignias. They treated this carefully with good reason – it’s illegal to even possess in some parts of Europe. 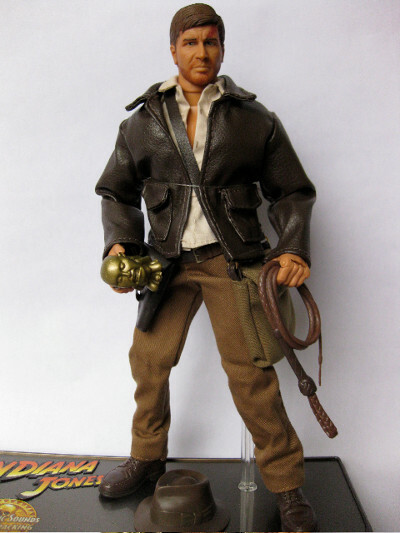 But the German uniform Indy wears in Raiders was thankfully pretty generic, so Hasbro didn’t have to go as far with this one as they did with the (awful in every way) German Officer 12” figure last year. The jacket is vaguely screen accurate – the green’s a bit too Chairman Mao and the collar emblems aren’t there, though they are very faded in the movie. The belt’s leather K98 pouches look decent, as do the harnesses and buckle. 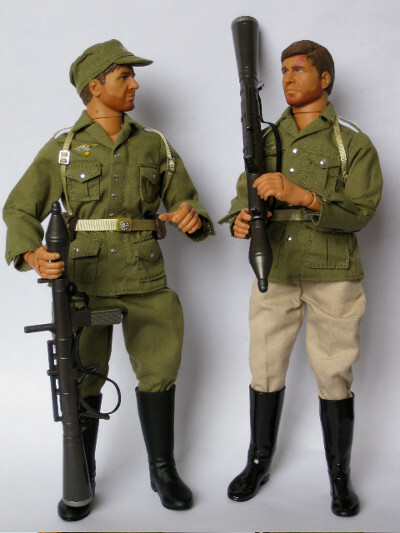 The green pants and cap are plain wrong (and contributing to the 1950’s Chinese uniform look,) possibly done to pull it away from the German uniform look. In the movie, Indy sports a tan Afrika Korps (well, this is several years before the Afrika Korps in N. Africa) cap with insignia and beige officer’s pants. The boots are okay, perhaps a reuse of the same mold as 12” Dooku’s, but they do the job. I did a quickie fix of the uniform, shown in the pics. Like anyone plays with 12” dolls anymore, kids included. But despite this probably not being the most exciting choice for an Indy figure in terms of play possibilities (no whip, no idol, no fedora, very scene specific), it has a great facial expression, somehow more expressive than the previous releases, and so elevates the display value. The paint on those eyes! Cross-dressing mascara Indy is not something you want in your collection. These really only hit retail for a short while (mostly Pacific Northwest it seems), so EBay is it. While some brave and loyal souls paid big money ($100 or so) for this guy when he was first released, I was patient (and cheap…) and paid around $35-40 for each. That seems around average these days. You can search ebay, or hope that the leftovers hit someplace like Big Lots or TJ Maxx at some point. Figure from the collection of lightmanrotj.